I am trying to install the minimal live iso on a supermicro 5015M-MR server and the live install fails with an Xorg error. The error is "Failed to open protocol names file lib/xorg/protocol.txt. Does the minimal install have no support for X ? I tried to install Mangaro Linux and it was hopeless on this HW, so I tried Antergos and it is going much better. During installation when you get to the step where you select your desktop, what did you choose? If you chose “base” then I’m almost positive that Xorg isn’t installed. I could check on my minimal live install to make sure, but it will have to be tomorrow. Did the install itself fail, or did it fail after install and you tried to start x? @pudge I boot from the live DVD in a USB DVD. The system starts and givers me several virtual screens and I can switch screens and login as root. X is still failing with the same message. How do I do a install to HD from here ? @pudge I dont try to start X; the live CD startup does it and fails with both the default boot and the non-graphical boot. The screen text is broken if I select 1280x1024, but on default it seems to automatically switch to 1280x1024 and is clear. For your info only; I am happy with this. Is it may one like this? @joekamprad As I want to use this as a server and character mode is good enough for me, all I want is basic VGA mode which the card supports. As the live DVD boots to terminal mode, how do I install Antergos using the commandline rather than the GUI frontend which is not available. Can anyone point me to documentation on how to do this ? If minimal install is enough, then it just might work to install the Antergos Base install to another machine (maybe VM) and simply copy all installed files to the target system. But you need to be able to boot to the target in order to copy the files, chroot, and make the target bootable. @joekamprad Thanks for all your help. I checked the above post (topic 4868) and it seems I should try archLinux next. However I was using Antergos as an easier way of getting an Arch system up and running fast. It seems I should scrap the old server and get a cheap new box. Likely it will use less power and for a 24/7 home webserver that saves money. Also the fans from the 1RU box are powerful and noisy. The cpu reads only 27C ; at 12000 rpm the fans are doing their job. So new box, less power and less noise. See how Antergos goes on a new box. It seems I should scrap the old server and get a cheap new box. So new box, less power and less noise. Since you are talking about new hardware, If I may be so bold as to offer a suggestion. The most power efficient and inexpensive system I have found for a server is a an Odroid SBC (Single Board Computer) which has an arm chip. So the drawback is you have to use Arch Linux Arm, which is not as hard to install as Arch Linux believe it or not. I have an Odroid XU4 which is based on a Samsung ARM arm v7 chip. On this server I have ssh for Linux, samba for windows, minidlna for DLNA devices, and a Plex server. All working great. 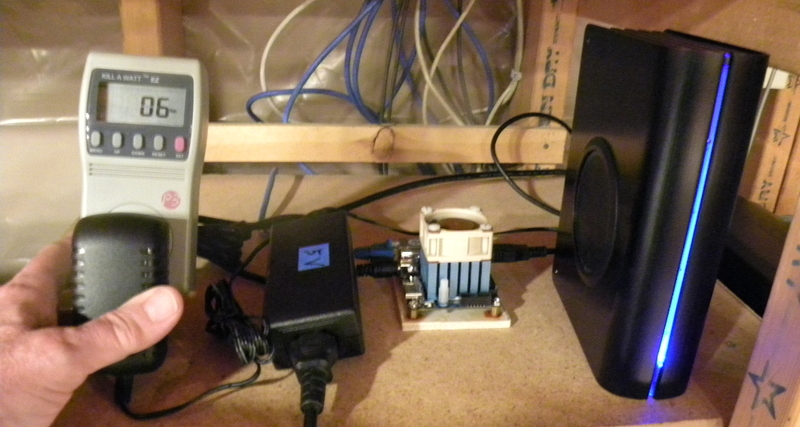 Here is a picture of my system with an external WD red label 2 TG NAS hard drive. Note that the Kill-A-Watt in my hand reads 04 which is watts drawn at the power outlet. 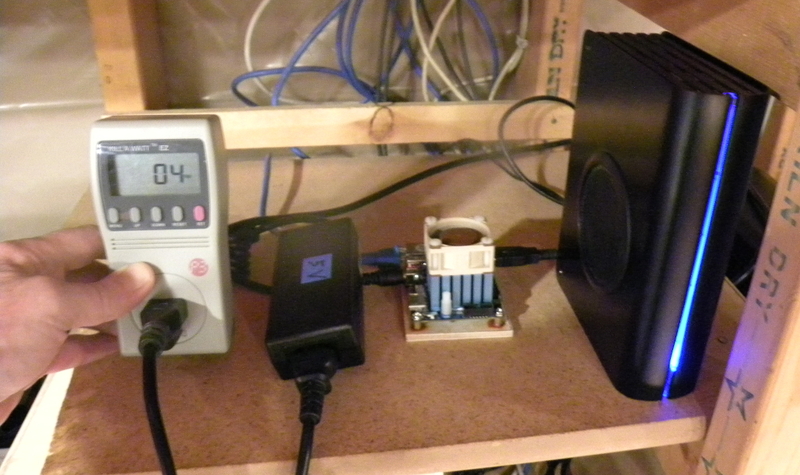 here is a pic with the external Hard Drive unit plugged into the Kill-A-Watt. The reading 06 watts. The media storage uses more power than the computer! Of course if you need less storage, maybe 512 GB, a SSD would draw less power. Anyway 10 Watts for the entire unit. Just offering as a suggestion that you may want to look into. I spent a lot of time researching what to use and came up with this. Some are doing this with a raspberry pi, but I recommend using the Oroid XU4Q as it is the most powerfull with 8 cores, 2 USB 3 ports, 1 Gb Lan port, and 2 GB of ram. I like the idea and your info, especially the Samsung CPU; for me anything in the ballpark is better than Intel. Down the track I will try it (hopefully). Right now I need a system up and running yesterday, so it could be Officeworks later today for a cheap lowend preferably non-Intel box. Thanks again for everyone for their suggestions. All were helpful. To paraphrase the Bible, from the counsel of many comes success. I forgot that there is one little problem installing Arch Linux arm on the Odroid XU4, but it easy to remedy. Go to the following link and look for the post from user supro47 for the fix.